- Improved feedback given on tasks when they are prevented. Advice is more specific and there is no longer a lag before they update. - Fixed translations in some languages where it said 'Home' key rather than 'H' to return to the entrance. - Fixed bug where guests and staff wouldn't move out the way in very specific circumstances. - Added dialog on game load which complains if the game cannot access the save folder. The idea is to force opening access first so no progress is lost. - Completely revamped system for packaging 3d models to decrease load times. - This also seems to fix one issue facing the Linux version of the game but may not resolve all issues. 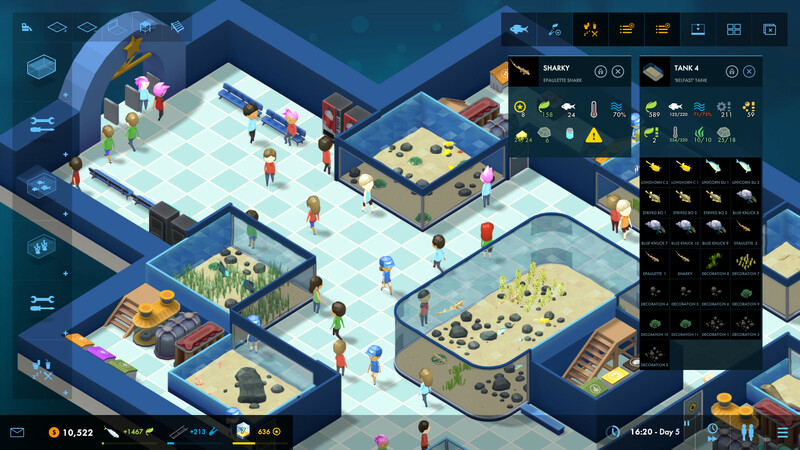 - Increased performance on main thread for better UI responsiveness in large aquariums. - Increased performance of save and load menu. - Reduced memory usage of save and load menu. - Fixed issue where staff in level up window would poke through windows in front of it. - Fixed issue where closing the rank up window after clicking the rank up button would get the game stuck. - Fixed minor graphical bug where rank tabs in research window would remain highlighted after everything was unlocked. - Tweaked a few portrait positions to stop them escaping their boxes. - Tweaked text in first level a little. 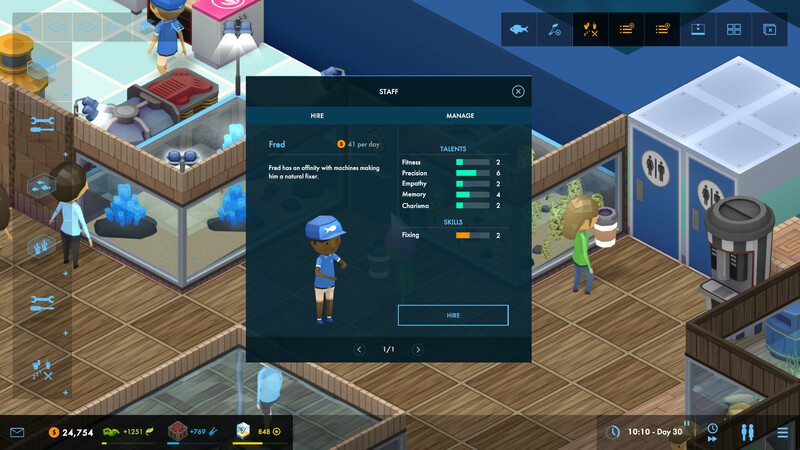 - Added staff priorities to level up messages. - Added fully grown active swimmer requirement to tooltip. - Fixed bug where cashflow was misreporting the costs of food, drink and gift shop items. - Fixed bug where guide book and balloon refills were too cheap. - Fixed bug where calcium reactor was free. - Reduced number of horse eye jacks given as gift in Myra level from 5 to 3. - Fixed bug with deep outcrop tank where staff would go inside temporarily if you dropped it on top of them. 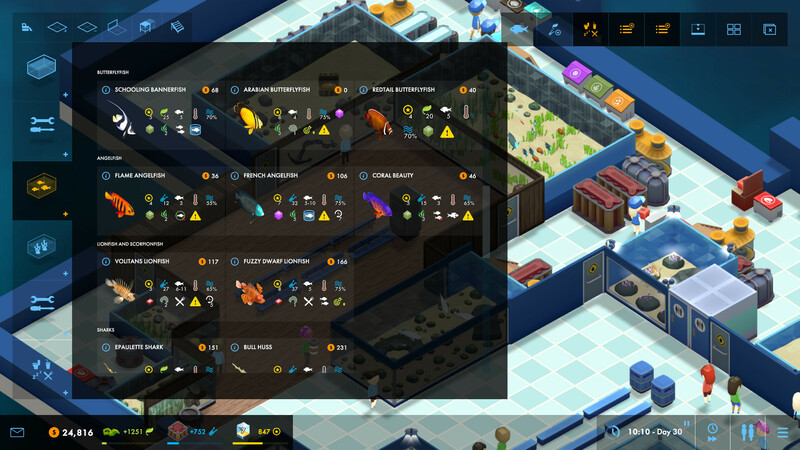 - Fixed bug where Blue Whiting had no ecology point value. - At end of day we don't auto drop items that are being carried by the player unless they are tanks or animals. - Scenery no longer produce negative prestige if a guest sees it over and over. - Fixed bug where staff learned slightly slower on fast mode. Added information about the max size an animal can eat when fully grown to its tooltip. Slightly reduced volume of small tunnel tank. Added difficulty tooltips on the main menu. Redesigned animal animation system to avoid clipping issues and weird movement of larger animals. Fixed various issues to do with animals eating each other. Fixed bug where negative prestige would not show on prestige bar on load. Fixed various minor graphical bugs.